Fazekas, M. – Chvalkovska, J. – Skuhrovec, J. – Tóth, I. J. – King L. P.: Are EU funds a corruption risk? 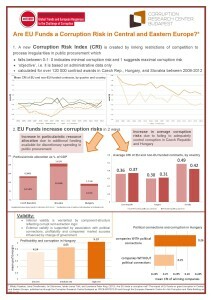 The impact of EU funds on grand corruption in Central and Eastern Europe. Working Paper Series: CRCB-WP/2013:03. 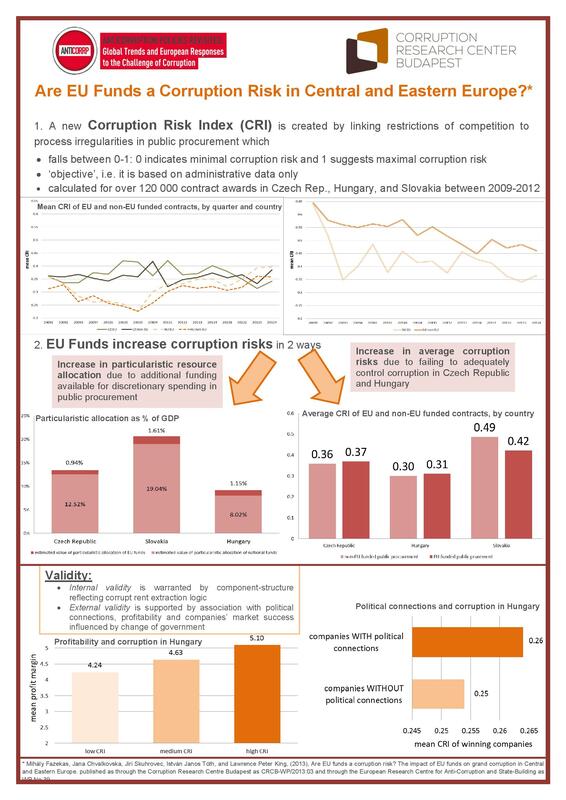 The paper explores the impact of EU funds on institutionalised grand corruption in public procurement between 2009-2012 in three countries: Czech Republic, Hungary, and Slovakia. We analyse a unique pooled database containing contract-level public procurement information for all three countries. We develop a composite corruption risks indicator based on the incidence and logical structure of ‘red flags’ in individual public procurement transactions. Preliminary findings indicate that EU funds impact institutionalised grand corruption, first, by providing additional public resources available for corrupt rent extraction; second, by changing the motivations for and controls of corruption for the additional resources. Preliminary calculations indicate that the first effect increases the value of particularistic resource allocation by up to 1.21% of GDP, while the second effect decreases it by up to 0.03% of GDP. The latter effect is entirely driven by Slovakia; in Czech Republic and Hungary even this effect increases particularism. Policy recommendations call for radically improving the EU’s monitoring and controlling framework.